If you've looked enviously at tall-masted sailboats gliding confidently through the ocean and thought, "I want to get on those," you're in luck. Island Windjammers' newest ship, Vela, is a true sailing ship, with three masts and billowing sails, offering a barefoot cruise -- one that concentrates primarily on sun and surf, without a lot of extras -- that really does take you off the grid. With Vela, the line has come into its own. The former Tole Mour, a sail-training ship that had been based in the Marshall Islands since its 1988 launch, underwent a major refit prior to its December 2015 debut. The dormitory-style accommodations were converted into single- and double-occupancy cabins, all with private baths and portholes. Teak decks were installed, the passenger lounge was expanded with an indoor breakfast area and the line's signature gleaming wood installed. And for fans of real sailing (and not just motoring), Vela also fits the bill. While the engine is used most of the time when the ship is crossing rough channels between islands, the vessel does set aside some afternoons and early evenings to unleash the sails from its three masts -- an experience that elicits "oohs" and "ahhs" from the passengers who diligently film the crew as they hustle their way around the boat. Beyond that flurry of excitement, life on Vela is decidedly relaxed. The ship carries paddleboards and passengers are given snorkel gear for the week (you can also bring your own). There's a rope swing that delighted the younger set -- the ship attracts a fair number of older kids, teens and young adults traveling with their parents in the summer -- and you could swim off the ship when the currents were calm. Otherwise, entertainment is what the passengers make of it; on our sailing, people spent time reading, chatting or playing games such as Cards Against Humanity, charades or Farkle (a dice game). If you're someone who needs to completely unplug, this is your ship. And if you don't….well, Vela's determinedly casual attitude may not be the best fit. We do feel there's room for the ship's cruise director to provide a little more structure for its passengers -- perhaps giving them more options for tours on land or organizing a trivia game during lazy afternoons or evenings, for example. Personally, we also wanted a little more information about where exactly we'd be at different times; had we known we'd be in a sleepy Martinique beach town for an entire day, for example, we could have scheduled an independent tour. But the company makes no promises about what islands you'll visit and when, so come prepared to go with the flow. And really, how hard is that, when the smaller Caribbean islands beckon? 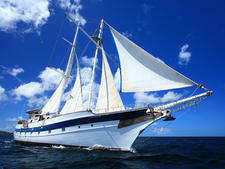 Vela sails from St. Lucia and Grenada, in both cases from marinas that are far away from the mainstream cruise docks. Some of the islands you'll experience, such as Iles des Saintes or Carriacou, might be well known by the yachtie set, but they're undiscovered by cruisers. If your idea of bliss is a sandy beach with no crowds and no agenda, Vela could be your perfect fit. 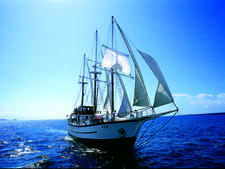 Vela's passengers tend to be Americans and other English-speakers, ranging in age from 40s to 60s. While some have sailed on mainstream cruise lines, others are more familiar with the sailing and yachting world. The minimum age to sail is 8, and you are likely to find a few children and teenagers onboard during the summer months. Island Windjammers encourages passengers to use soft-sided luggage, preferably a duffel and really, that's all you need. Daytime is spent in T-shirts, shorts, swimsuits (bring two) and cover-ups. In the evening, passengers may shower and change into sundresses (women) or shorts and a clean T-shirt (men). Tennis or water shoes are recommended if you do the optional island tours that are offered in Dominica and Union Island (depending on itinerary), but sturdy sandals also work. Otherwise, flip-flops are fine. The line recommends $150 per person as a tip for the entire crew on a six-night cruise; tipping individual crew members is not encouraged. It can be given to the cruise director in cash or put on a credit card when you check-out at the end of the sailing.